Just as the 1990 classic car price boom was waning I gave a Ferrari Testarossa a mixed review. It was exciting enough but suffered I thought from a higher centre of gravity compared with other Ferraris. Its engine was big and wide, making it difficult to accommodate low down in the frame. By the last decade of the 20th century there was no need for cars with top speeds getting on for 200mph to feel “difficult” or slightly dangerous. You could get just as much speed and acceleration from the likes of a Honda NSX without any need of macho airs or acting like a grand prix driver of the 1950s. Before the time of Michael Schumacher whose car is at the Design Museum until April 18. SUNDAY TIMES: 30 June 1991 Ferrari. Premiums on near-new Ferraris have all but vanished. Speculators who bought one to put in an air-conditioned garage two years ago saw its value double, - and then fall back again to what they paid for it. There is still a four year waiting list for new Ferraris and Maranello Concessionaires stopped taking orders as long ago as May 1989. Ferraris have been a sign of wealth for more than forty years and have a raciness derived from winning more grands prix than anybody. But now that Japanese challengers beat Ferraris on the racetrack, and produce realistic road-going rivals at half the price, even aficionados are wondering whether they are worth the money. Ferrari's flagship is the Testarossa (red head - the cylinder heads were painted Italian racing red). Named after an evocative sports racing car of the 1950s ironically the last great front-engined racing Ferrari the modern Testarossa has the engine behind the driver. It is a wide flat engine, with two banks of twelve cylinders lying on their sides, squeezed between fat rear tyres. The effect is to make the Testarossa nearly 2 metres across, 4 inches wider than a Rolls-Royce. This means, given the car's tendency to dart nervously about on bumpy roads, aiming it only for very wide gaps in the traffic. The driver looks out at the world level with pedestrians' waists. Ferrari gearshifts work within a slotted steel grating, which takes a little getting used to, but allows the lever to be thrown from gear to gear with great vigour, racing-car style. The 5 litre engine comes to life unexpectedly quietly for nearly 400 horse power; the bangs and thumps the huge tyres make crossing motorway expansion joints is more tiresome and the ride at low speeds so harsh as to be literally breathtaking. The Testarossa accelerates to 60mph in about 5 sec, 100 mph in just over 11 sec, and 140 mph in around 25 sec. I accept the manufacturer's word, for the time being at least, that the top speed is 180 mph. 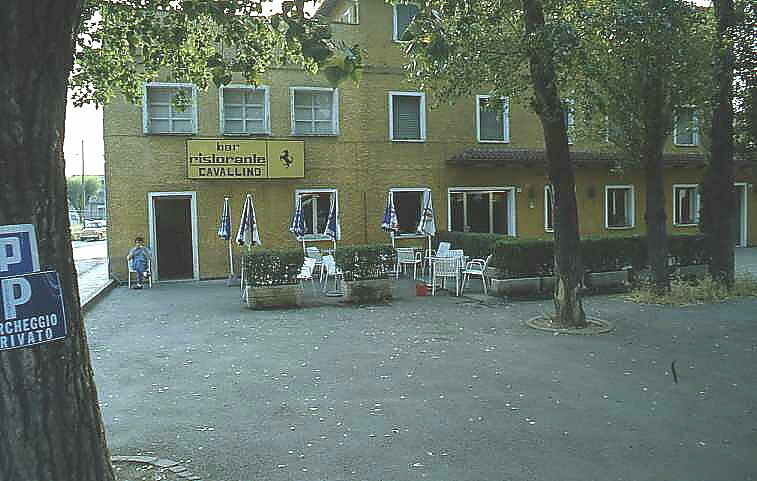 Cavallino restaurant opposite the factory gate where I my wife and I once had lunch with Enzo Ferrari. Compared to a Mercedes-Benz SL or a Honda NSX the Ferrari feels agitated and highly-strung. Its harshness prompts the question whether Ferrari is able to make a refined car like Mercedes-Benz or Honda do, or is pandering to customers, as Porsche used to who do not know that fast cars no longer need feel difficult or austere. Americans especially never think they are getting their money’s worth from a sports car unless it feels downright dangerous. Ferraris smaller than the Testarossa are less dramatic and a great deal more roadworthy. The 348 has a 3.4 litre V8, great style and is nimble where the Testarossa is clumsy. It is sufficiently slim to choose a much faster course through bends, and sufficiently light to use its 300 horse power for speed rather than overcoming a Testarossa's 33 cwt (1668kg) of inertia. Honda knew which car to mimic for the NSX. Dedicated Ferraristas tend to sneer at the pretty Mondial which is more civilised still and could almost be mistaken for a Fiat. The interior, like the others, is undistinguished but has rear seats big enough for people not just small children. Ferrari prices may no longer command a premium but with a four year waiting list there is unlikely to be much room for negotiation. 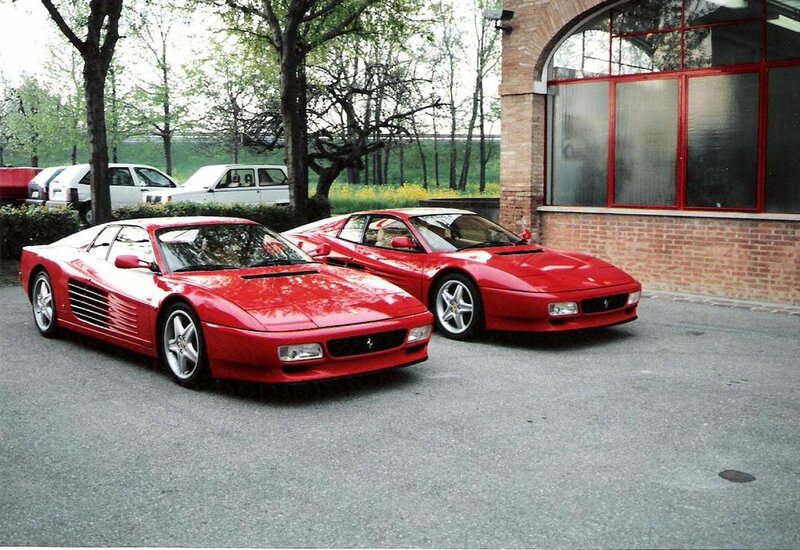 Testarossa £123,119; 348 TS £76,149, and Mondial T £66,923. The managing director of Maranello Concessionaires, the importing company, Roger Maingot used to complain that careful owners who kept their mileage low to maintain their cars' value ruined his spares and servicing business. He need not worry. Maranello has the world concession for pre-1975 Ferrari spare parts for which it could, if it cared to, charge pretty much what it likes. Ferrari collectors who want the best are prepared, and generally able, to pay for the real thing.